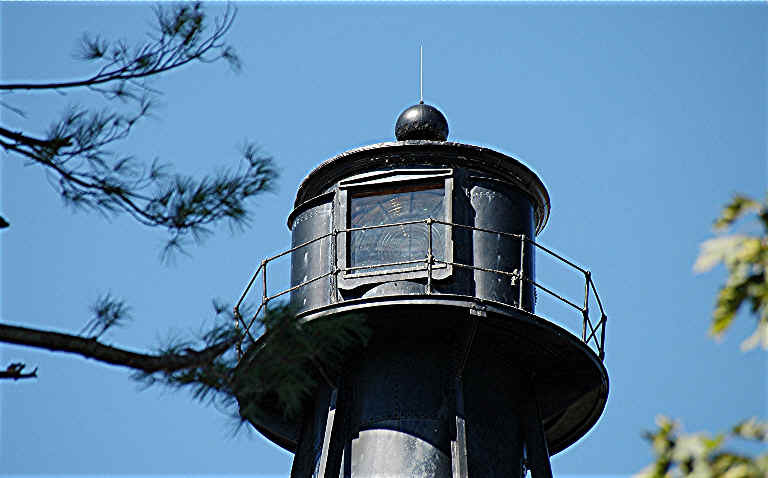 At its Board meeting in September, the Directors of the Foundation voted unanimously to discontinue the organization's lease of the 101-year-old Liston Range Rear Light Tower. "It was a difficult and sad decision," Foundation President Judith Roales said later. "But it was the responsible thing to do. We have neither the volunteer power nor the financial resources to care for a light so far from our base of operations in Sussex County." The action will have no impact on the DRBLHF's other lighthouse activities and responsibilities, all of which will continue...and continue to grow. 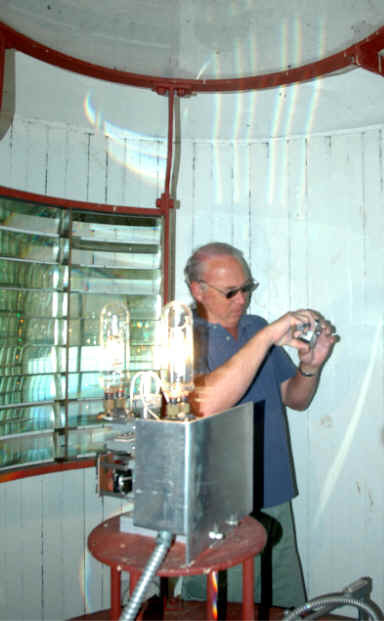 Board Members and other friends of the Liston tower -- including Director Harry Spencer Jr., who was born at Liston Rear while his father was keeper there -- made a final official trip to the light recently. 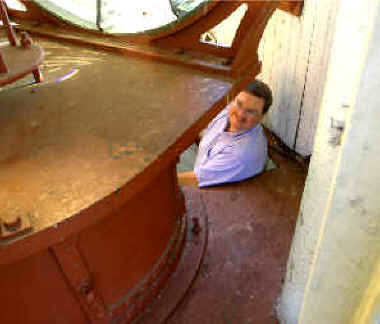 In addition to removing Foundation belongings and making sure the property was as it had been when they took over two years ago, the visitors climbed to the top of the 126-foot tower for a last look at the awesome second order Fresnel range lens and the unusual Fresnel reflector that sits behind the light source. Photos from the visit are shown below. 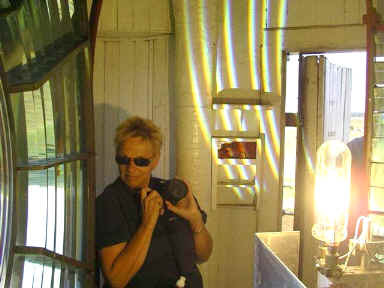 To view photos from another visit to the Liston Range Front Lighthouse, click here. 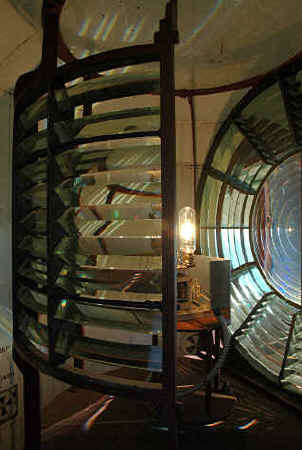 The front lighthouse was recently sold to a new private owner by Foundation friend Dr. Bill Duncan. 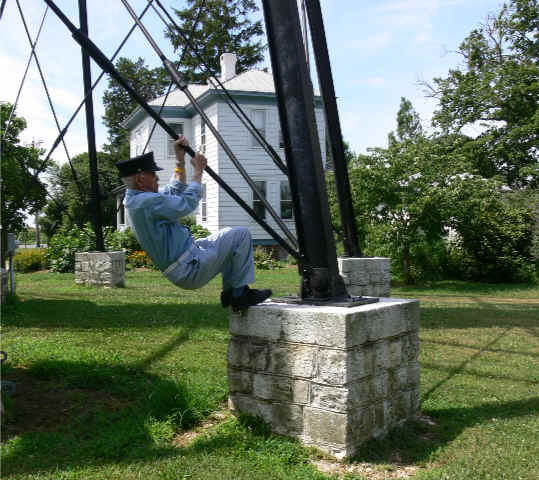 Harry Spencer revisits some of the tricks of his childhood, using the angle iron braces of the tower as a jungle jim. 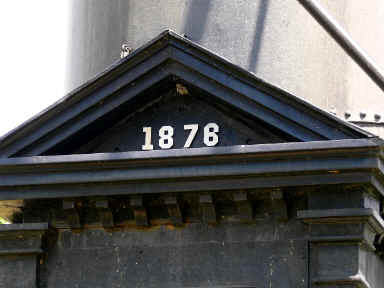 Outside, the 1878 numerals above the iron door mark the date the light tower first went into service on the Port Penn Range. 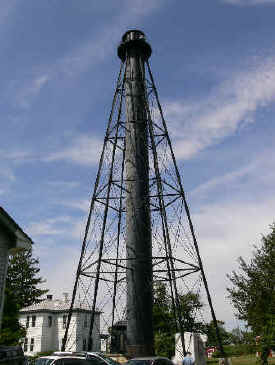 The tower was moved to Liston Range in 1906. 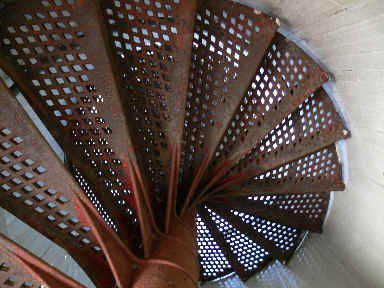 Inside, iron stairs ascend to the watch room in a tight spiral of red. 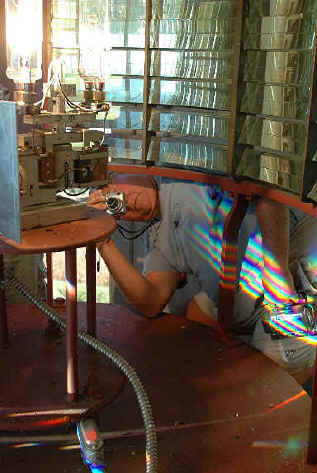 The massive lens, nearly six feet in diameter, completely fills the window through which it sends a powerful beam down a 20 mile range. 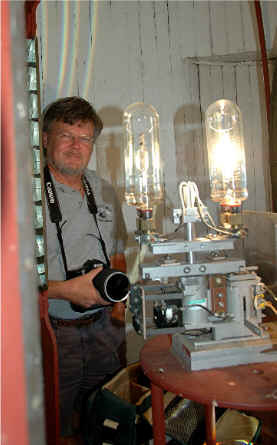 The huge lens and a reflector, their prisms set in brass that is dulled with age, surround an automatic bulb changer that holds two 1,000 watt bulbs. 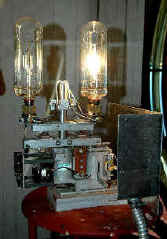 The light burns 24 hours a day. 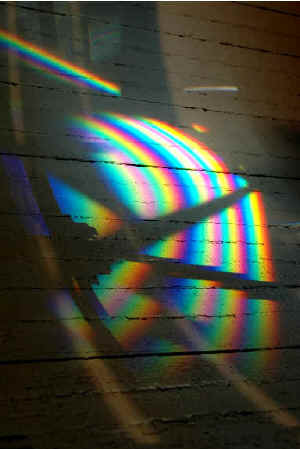 When the sun strikes the prisms of the lens colorful rainbows paint the tongue-in-groove walls. 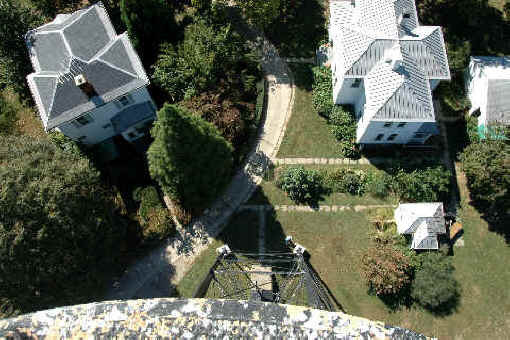 The view from the narrow walkway around the lantern room gives a unique perspective on the tower itself and on the buildings that were once part of the lighthouse reservation. The house on the left is the assistant keeper's house. The one on the right is the keeper's house. Behind it is an oil house. 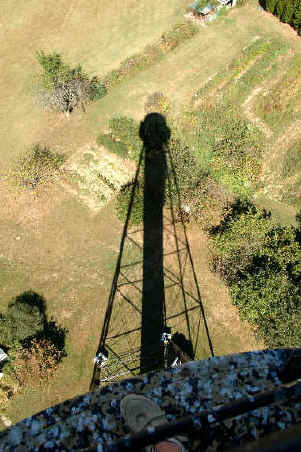 Since the rear light tower sits three miles from the Delaware River, it is surrounded by a quiet agrarian scene. 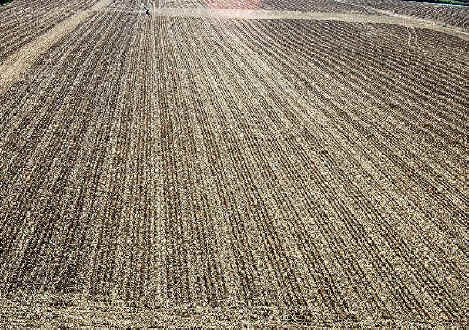 The corn has been harvested now and the empty fields are brown with chaff. 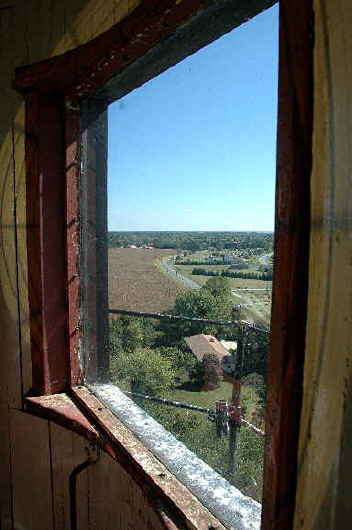 Board Members at the top of the tower included (above, L to R) Red Moulinier, Herb von Goerres, and John Gordon. Also (L) Dave Lowe and (R) Judith Roales. Harry Spencer, with more climbs to his lifetime credit than any of the others, stayed below this time.